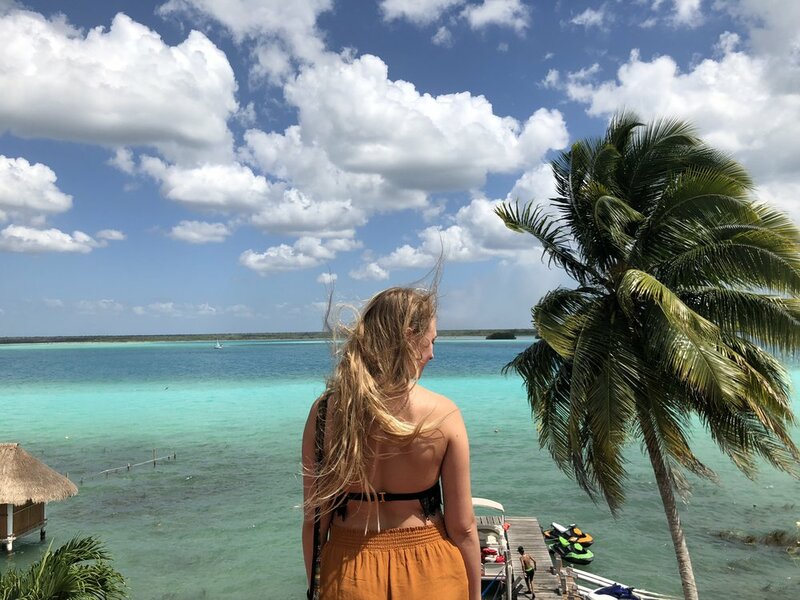 I was tempted not to write about Bacalar because it’s so beautiful and not very touristy yet - I honestly almost want to keep it to myself. But - here we are and I’m ready to share this gorgeous spot with you. If you’re looking for a Mexican adventure and you’re cool with traveling a little more rustically (which, if you’re on my blog, let’s hope you are), you love swimming, and dig getting to know local food. 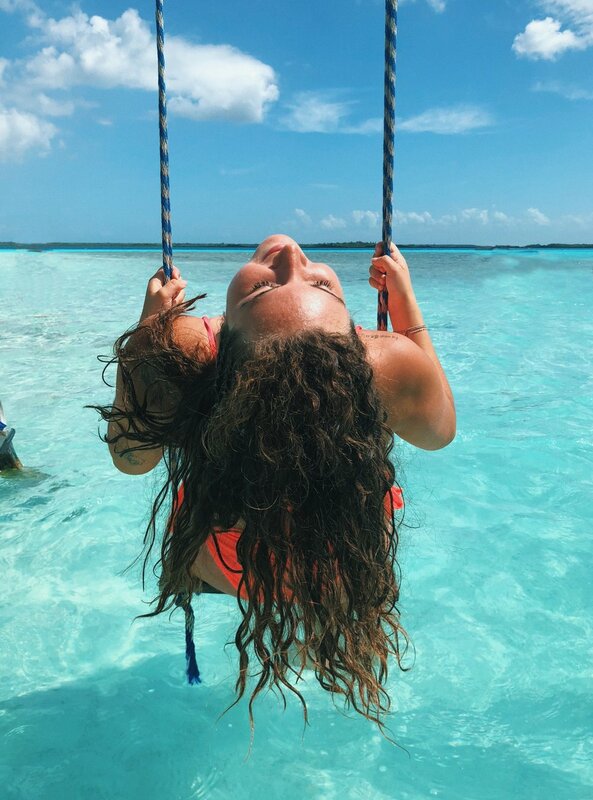 Bacalar is 100% the spot for your next vacation. My friend and I grabbed some kayaks and just went for it. We went up the lagoon to the black cenote and spent hours swimming, jumping off the ledge, and snorkeling. Legit one of my favorite things I did this year. Learn more about it here. Walk (or bike) to the center of town in the evening and do some taste testing of the local street food. Honestly, just walk around and try one of everything it’s all so good! If you go around 6-9pm it’ll be nice and busy with lots of tourists and locals alike walking around the vendors with local goods for sale as well. *Pro tip if you’ve got a week stomach? Just eat vegetarian and go where you see the locals. Literally the best food the whole trip. It’s on the street between the lagoon and the town. SO GOOD. Just order everything. ⚡️Now, to the technical aspects.. Since you’re now hooked on visiting Bacalar, here’s a few things you should know. I’d recommend flying into Cancun and then taking a bus down. Personally, I like stopping in to Tulum for a couple days as it’s on the way! Take the bus to Bacalar from the ADO bus terminals in town. It takes about 2.5 hrs and costs about $15. Take the bus from Cancun airport for about $20, it’ll take around 4.5 hrs. *Once you get off the bus you’ll be able to take a cab for a few dollars to wherever you’re staying. You could also rent a car if you prefer to drive but keep in mind that these aren’t super built up roads and most of Bacalar town will be dirt roads. You’ve got two options - either stay in town or along the lagoon! If you’re okay with a bike ride or long walk into town then I’d 100% recommend staying along the lagoon (there’s also cabs you can call if need be). The town is cute but there’s something about waking up by the water that’s just so lovely. Hostels: check out Hostelworld to find your ideal spot. I’d recommend looking for one that includes free kayaks and bikes. Hotels: there’s a couple more lux ones further out from the town if you’re looking for a pool and other amenities. Airbnb: all over with a huge range of price ranges! Great way to get the local experience. Bacalar is still pretty cheap considering how freakin incredible it is. If you’re on a budget, a hostel would be a good way to go. The food is also super affordable especially if you’re okay with some delicious street food!